Naza will be launching it’s new Naza Sutera (Naza NX-01) tomorrow in Bertam, Penang. The Naza Sutera will be Naza’s first foray into the national mini car market, currently dominated by the Proton Savvy and the Perodua Myvi. Naza also sells the Kia Picanto but that’s not really the same price range and it is considered an import car. Also at the launch will be importers from the UK, India, Pakistan and some Asean countries. Naza will be signing agreements with these importers to export the Naza Sutera (Naza NX-01) to their countries. Out of 30,000 units of the Naza Sutera’s production yearly, it’s expected that 33% which is 10,000 units will be destined for export. Exports are expected to start in 3 months time. Update: Naza Sutera launched, more details here! 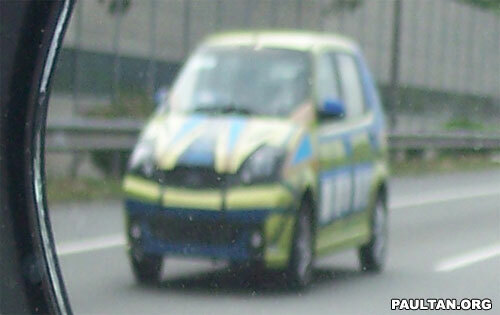 The Naza Sutera (Naza NX-01) will be a mini car competing with cars like the Proton Savvy and the Perodua Myvi. It is touted as a recession-proof car, economical enough to maintain and run even through recession. This market range hopes to convert motorcyclists to car users. Naza says the Naza Sutera was developed and styled by Naza at it’s Gurun R&D center together with Italia, British and South Korean designers. Although not mentioned in today’s press report, it’s quite clear that the car is based on the Hafei Lobo, a small Chinese car with a 1.1 litre engine. Naza re-engineered it to be right-hand drive and customised the styling to suit Malaysian preferences. The Naza Sutera is expected to cost between RM35,000 to RM40,000. Naza also confirmed that the Naza NX-02 will be based on the Peugeot 206 and will have a production of 10,000 units a year, with 3,000 of that amount for export. The Peugeot 206 based Naza NX-02 will be priced between RM65,000 and RM75,000 and is expected to be introduced in May. If you want to know how the Naza Sutera (Naza NX-01) looks like, have a look at the Naza NX-01 spyshots post. The original Hafei Lobo 1.1 that it was based on is also available for viewing here.